I moved into Pistilli Riverview East in Astoria on October 20, 2009. My apartment began leaking four days later on October 24, 2009. My apartment still leaks to this day. My landlord, Parkview Building Associates, LLC. is operated by Pistilli Realty. The way they manage this building is despicable and unacceptable. I’m not griping about cheap appliances or cabinetry. Those things are what they are and I willingly and knowingly entered into my lease having seen the cheap appliances and cabinetry. I did not knowingly and willingly enter into my lease to live in an apartment that constantly and persistently leaks and is covered in toxic black mold. 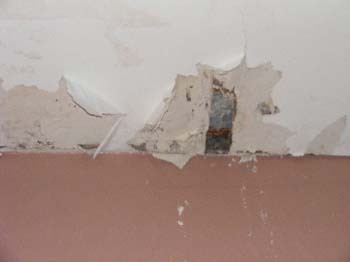 At a mere two posts long this blog sports moldering and disintegrating ceilings (as seen at left), some kind brown ooze gracing the window sills of the laundry room and allegations that the doorman is refusing admittance to census workers. One can only imagine what will happen next. Check it out!